Yesterday was certainly an exciting day for fans of the Specialist Games range as GW announced that some old favourites would be returning to our shelves as boxed games and stand-alone products. I had always hoped that GW might go down this route as it did with recent boxed versions of Space Hulk and Dreadfleet (a clear successor to Man ‘O War) and now we have official confirmation that it will happen although we are not sure when. However, you don’t need to wait months, or even years, for some Specialist Games content; there is plenty of Specialist Games coverage here on Miniature Miscellany in the archive. Here are a few of my favourite projects from the old Specialist Games range that I have worked on over the last few years. My Epic scale orks. 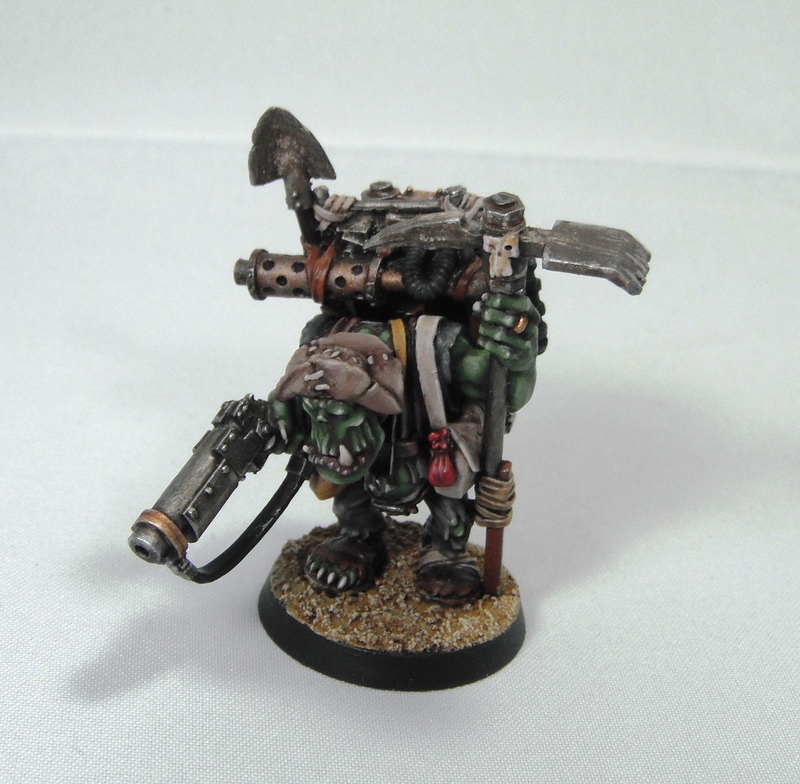 I have always loved the old-style orks and these models fit the bill perfectly. They are so characterful despite their tiny size plus the ork range is one of the largest in Epic. The great thing about orks is that they field a collection of rag-tag custom-built vehicles meaning you can easily combine models from different eras and this just adds to the eclectic look of the force. For these guys I went for nice bright colours which help such tiny models stand out on the tabletop. I also have a sizable collection of Epic Eldar hailing from the Saim Hann Craftworld. I always intended to paint up an army of their 40K counterparts but the age of many of the Eldar kits put me off and I switched allegiance to their dark kin instead. The Eldar were my first Epic force and I learned a lot about painting such tiny models from these guys. I also had a real soft-spot for Battlefleet Gothic and this was the one game that I was really disappointed they discontinued. 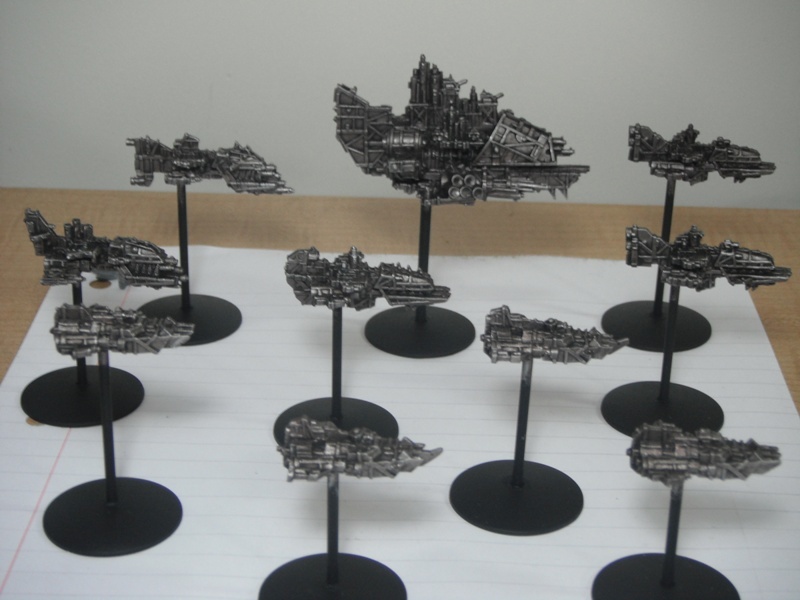 Here is my Imperial Fleet. They represent the Battlefleet Maelstrom defending the Badab region prior to/during the Badab War. 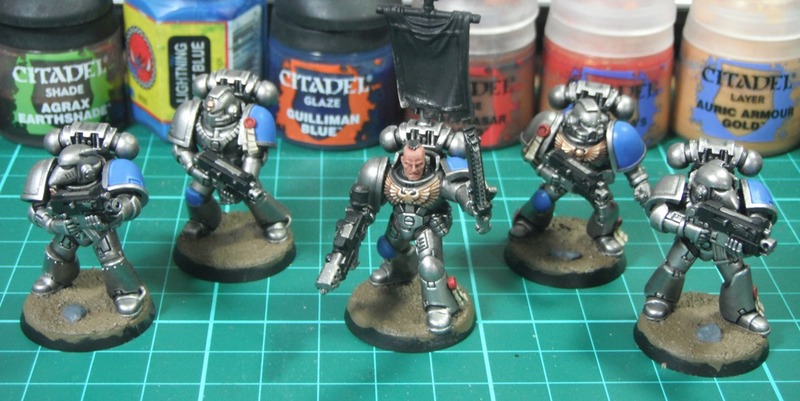 If GW ever release some Space Marine ships I intend to add some Astral Claws vessels to the fleet to tie them in more closely with my Space Marine army in 40k. I also have a nascent ork fleet which I painted up this test model for. I went for dirty metallics and red for the orks with bright green as a spot colour on the lights/eyes. I also added a tiny check pattern to add interest and emphasise the size of the ship. Finally, Mordheim was one of my favourite of the Specialist Games range and, unlike BFG and Epic which I came to later, I played it extensively when it was first released. Here are some Mordheim characters I painted up a few years ago. Interestingly, this isn’t one of the games mentioned in GW’s press release. 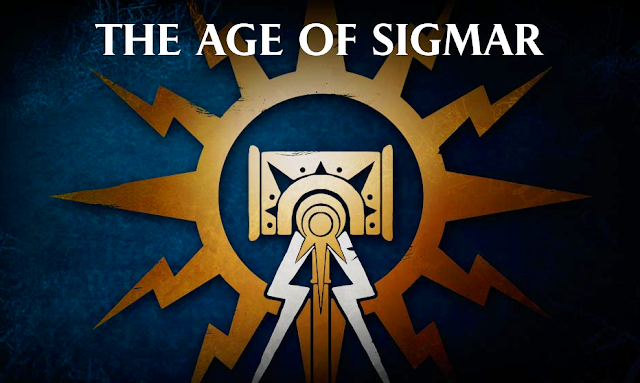 Perhaps this is because it is now set in the ‘World-That-Was’ or simply because the models are not radically different the the regular Age of Sigmar range. Maybe it was simply on oversight (I get the impression GW are still undecided on how many or which games will see a come back). This is just a selection of some of the Specialist Games content on this blog. If this has piqued your interest why not click on some of the tags below for more. The unusual way this news broke, along with some inconsistent-sounding elements such as the fact that this studio would be picking up the LotR/Hobbit franchise, led me to doubt its veracity. However, this seems to be confirmation from an official source that some of the Specialist Games will see the light of day once more (although no comments about LotR). I’m not sure why GW chose to release the information this way rather than making a grand announcement but the return of some classic games is certainly exciting news for the hobby. It seems that this may have been a blunder and GW did not intend the news to go public yet. Caution does need to be exercised though. At the moment GW are not promising anything more than “new boxed games and stand-alone sets” rather than a fully relaunched product range with continued support. So, all-in-all not too far away from what I predicted earlier. The year was 1995. X-Files was on the telly, Braveheart topped the box office and kids traded Pogs in the playground. It was the year the charts resounded to the beat of ‘The Macarena’, the UK was gripped by Girl Power and Robbie Williams split from Take That. 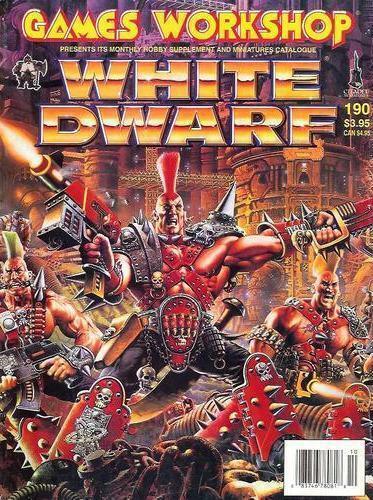 But more importantly for me, in November of that year, I walked into a newsagents and picked up my first copy of White Dwarf. Yes, dear reader, that means that this month marks my twentieth year in the hobby! White Dwarf 190. My gateway into the hobby. Twenty years is a big chunk of my lifetime (nearly two thirds) and, although a lot has changed in my life over those two decades, the hobby has always been an important part of it. From the age of 11, I avidly played Warhammer and Warhammer 40,000 along with D&D and other assorted roleplaying games. This was an exciting time for Games Workshop, the fourth edition of Warhammer and second edition of 40k had just been released, codifying and developing the two universes and introducing the format of the ‘boxed game’ which is now the norm for new editions. This period marked a massive period of growth for the company which expanded into many overseas markets. It was also the time when everything was bright red. The grim darkness of the far future was surprisingly colourful back then. Excitingly, when I started sixth form a few years later, GW acquired the license to produce models for New Line Cinema’s Lord of the Rings franchise. I had a part-time job at the local Co-op at the time and used the money to fund my avid collecting of these models. I still believe that these are some of the best models GW have produced to date and the game was one of the most elegant rule sets ever written. I read Lord of the Rings in high school. I also painted tiny metal models of the characters. Throughout my time at uni I, like many people, dropped out of the hobby for a while but would still buy the occasional copy of White Dwarf to see what was going on and picked up the odd set of models from time to time. I really got back into the hobby during my PhD. 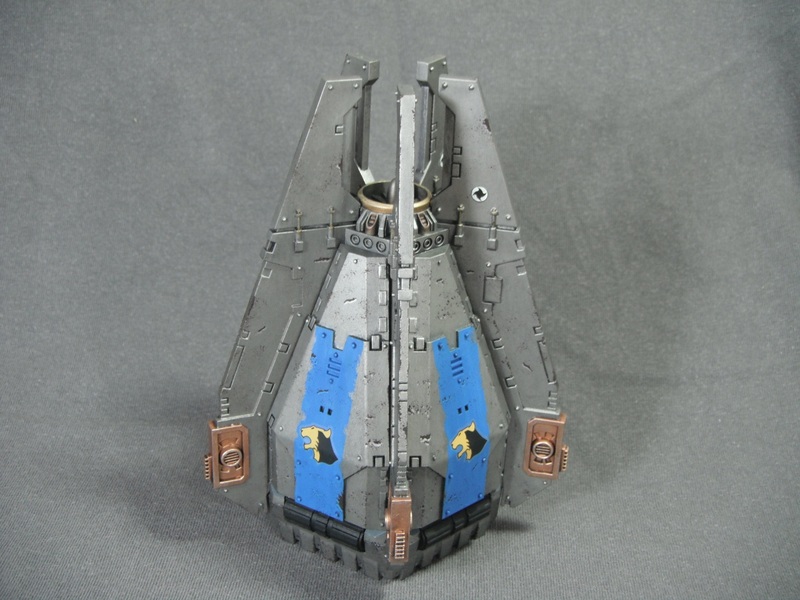 It was during this period that I really began to develop my skills as a painter (and, incidentally, when I started this blog) thanks in no small part to the Imperial Armour Masterclass books and the excellent ‘Eavy Metal guides that appeared in White Dwarf at this time. 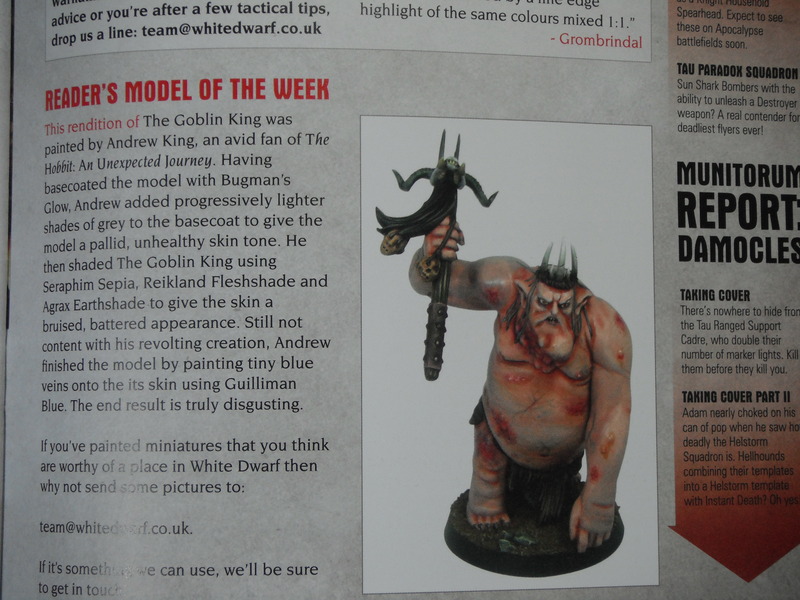 Since then I have become a qualified teacher and helped to run a games club in the school where I worked, I have realised a long-held ambition to have a model featured in White Dwarf and I even spent a short time working for GW as a studio painter. The Rise of Plastic – What is undoubtedly the biggest change for me is the rise in plastic. Back in 1995 most models were lead and plastic was mainly used for weapons, shields and steeds. The majority of the plastic models from the time were cheap mono-pose models which could be used to bulk out regiments. Nowadays, most of GW’s kits are high-quality, multi-part plastic which is not only easier to work with but also allows a far greater degree of versatility. Things are Less ‘Epic’ – Back in 1995 Epic was the third core game and really was the driving force behind the development of the 40k universe. Leman Russ tanks, Waveserpents and Imperial Knights are just three models to be introduced by Epic that have since become staples of the 40k battlefield. Sadly, as the ability to produce these models in 28mm scale was developed, the game was scaled back and eventually dropped in 2013. The End of the World – Yep, this is a biggie. 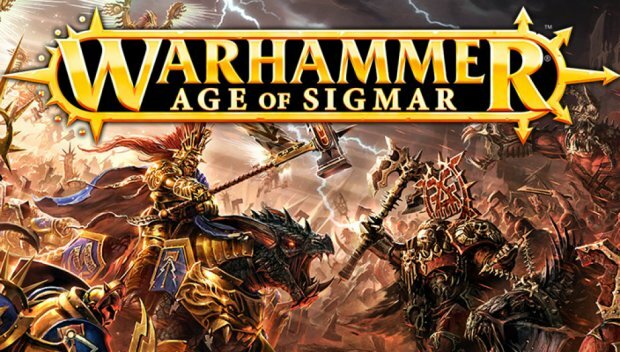 Earlier this year, Games Workshop took the bold step of blowing up the Warhammer World and ushering in the Age of Sigmar. You can read my thoughts on the subject here and here. 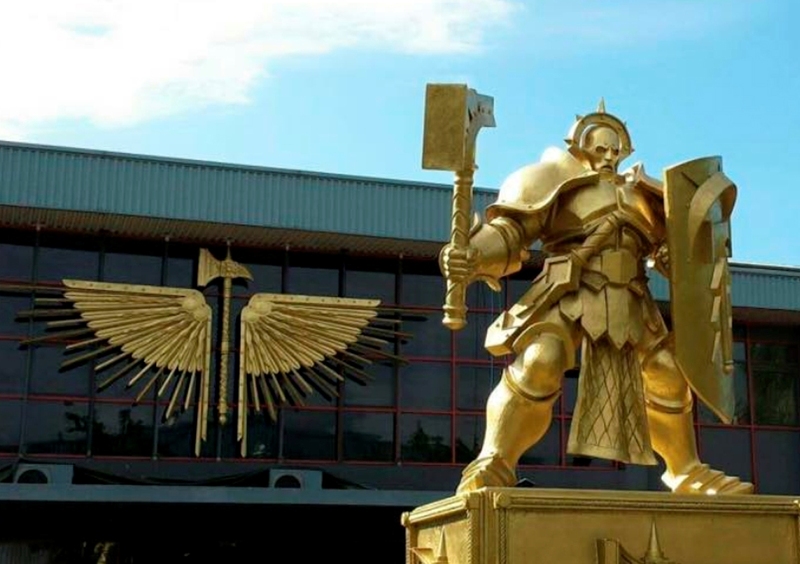 The Horus Heresy – Back in 1995 the Horus Heresy was a myth and the only Primarch models were the Epic-scale Daemon Primarchs (see, I told you Epic always got there first). We were told that 10,000 years ago there was a civil war but the details were deliberately sketchy and vague and it was presented as a mythical age shrouded in mystery. Now the Black Library are chronicling the events of the Heresy in meticulous detail and Forge World have released a fantastic range of models including some of the Primarchs themselves. The Decline of the Specialist Games – What would come to be known as the ‘Specialist Games’ range was really kicked-off in 1995 with Necromunda, which detailed the political rivalries and inter-gang warfare of one individual hive city in the 40k universe. This was followed by other fan-favourites such as Gorkamorka (1997), Battlefleet Gothic (1999) and Inquisitor (2001) which all explored different facets of the 40k universe. GW also launched the millennial Mordheim (1999) which ‘celebrated’ the year 2000 with its darkly comic play on Y2K fears. It is safe to say that without these games the Warhammer and Warhammer 40,000 universes would not be quite so rich and detailed as they are today. OK, #warmongers. What, for you, have been the biggest changes to the Games Workshop hobby in the last 20 years (1995-2015)? So, do you have a personal story to tell about your time in the hobby? What are your thoughts on the biggest changes to the hobby in the last twenty years? Leave your comment below. Recently, I have enjoyed reading a number of blogs which focus on what has come to be known online as ‘Oldhammer’. This particular moniker seems to have been around a while now and is generally attached to those blogs with a strong, or even exclusive, interest in early incarnations of Warhammer and Rogue Trader. 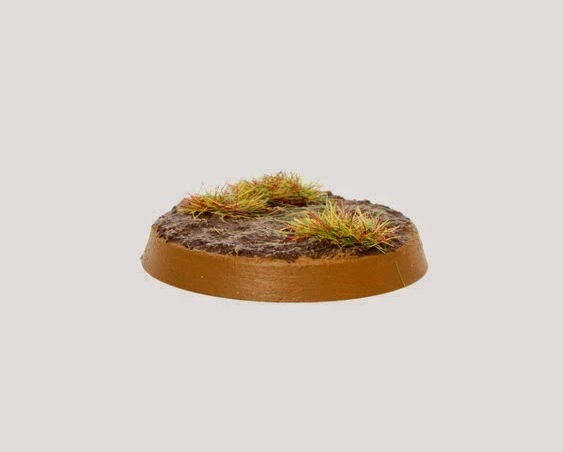 One thing that struck me about these blogs was that they do not merely engage in warm-hearted nostalgia for the good ol’ days of lead miniatures, polyhedral dice and lengthy random-generation tables (although they do do this) but have a strong focus on the narrative element of Warhammer and Warhammer 40,000 and are witty, mature and eccentric (much like the old GW ranges they cover). I have added a number of these blogs to the blogroll and would heartily recommend them. Here are my favourites in no particular order. 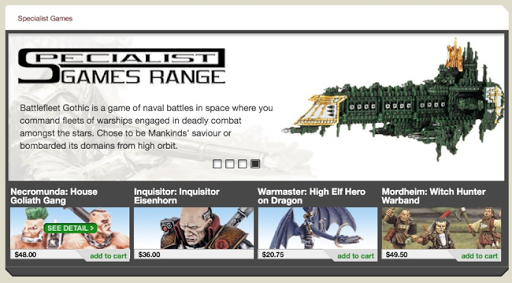 Classic Citadel miniatures and the games that use them. 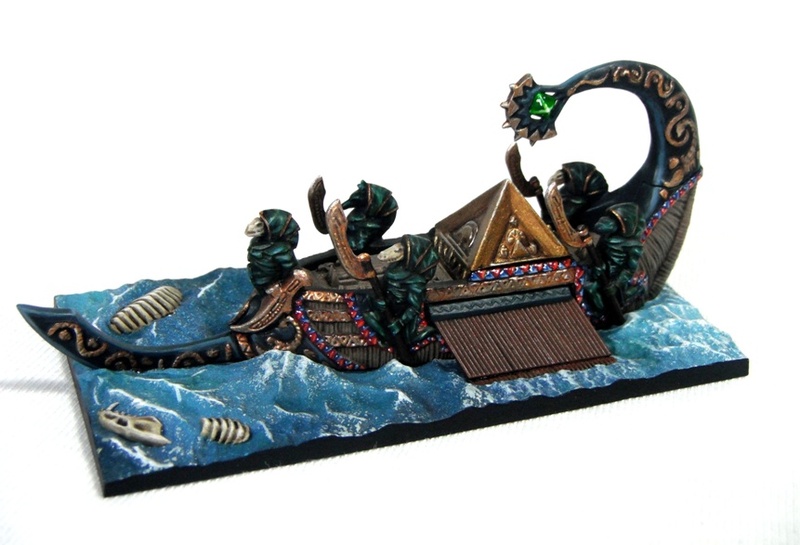 A truly fantastic blog by Oldhammer enthusiast, Matthew Sullivan. 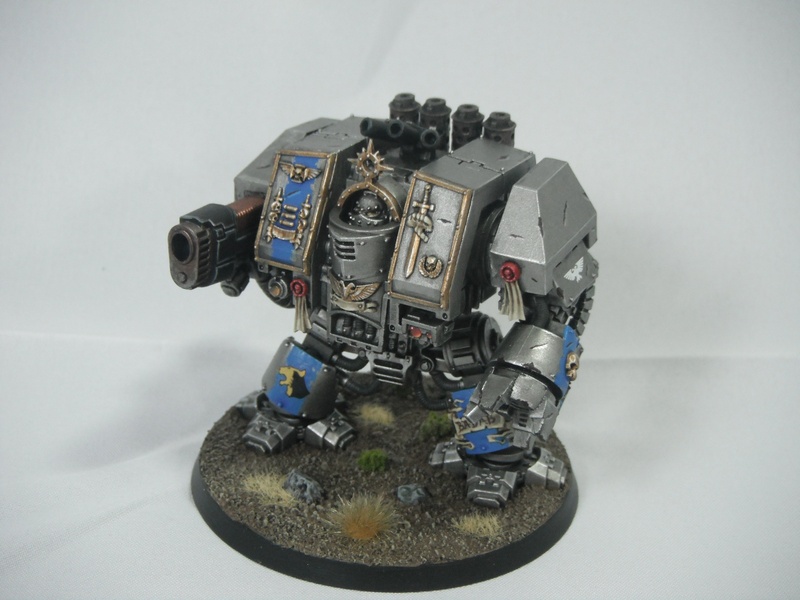 The blog is very intelligent and literary and offers amazing insight into the world of third edition Warhammer and other games. Not only that but it show cases some of Matthew’s fabulous collection of vintage models including some great baggage trains. 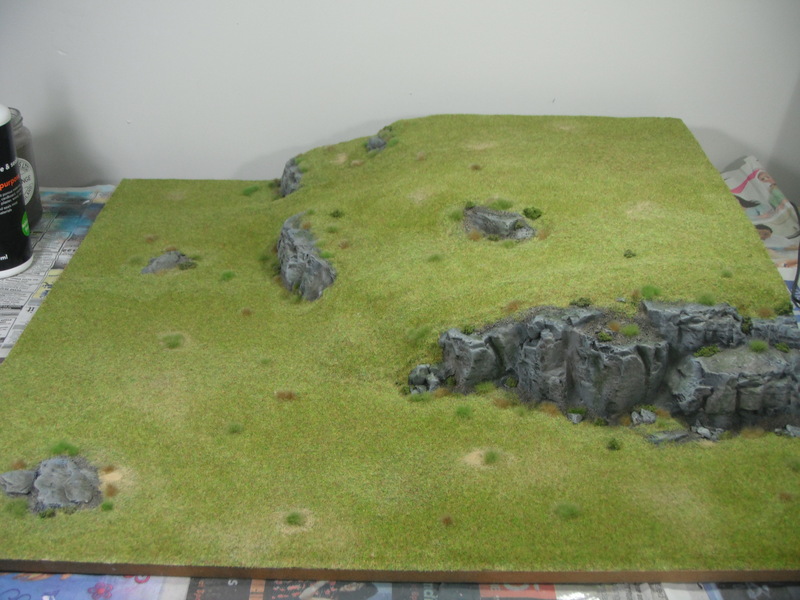 Although I don’t agree with all of his points (I got into Warhammer in the early ’90s and have a fondness for the models from that period), it is great to read a blog by someone with such passion for ’80s miniatures and for wargaming more generally. The adventures of a wargames amateur trying to get stuff painted and the real life that gets in his way. This is the blog of Whiskey Priest. 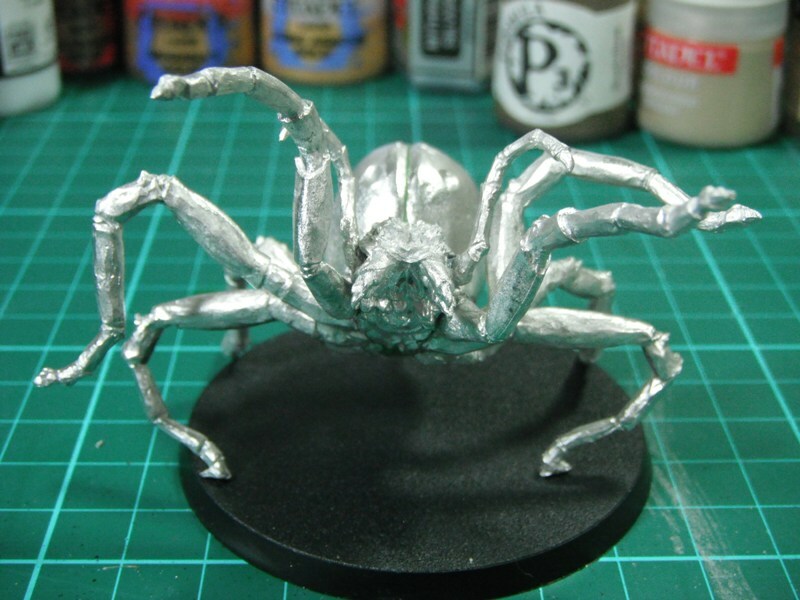 The main focus of the blog is on pulp sci-fi with a strong emphasis on Rogue Trader. 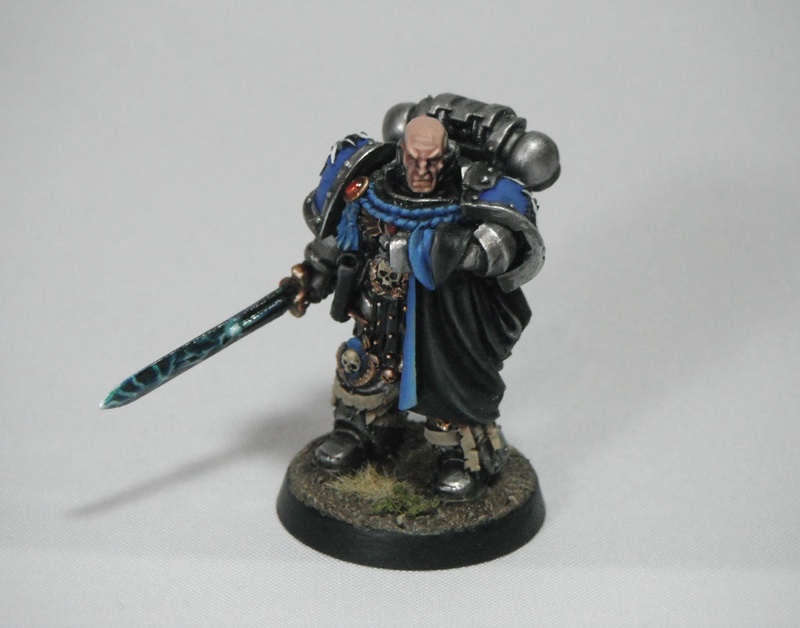 The blog is well-written and contains a wealth of information on the early days of 40k. A particularly interesting series of articles on this blog covers the myriad influences on the development of early 40k such as Frank Herbert and Isaac Asimov. Well worth a read. The eponymous blog of Sho3box. This is another pulp sci-fi blog which, although maybe not an ‘Oldhammer’ blog in the strictest sense, does feature a range of Rogue Trader and Judge Dredd models. Sho3box really embraces the story-telling aspect of the hobby through the use of small warbands and the Pulp Alley rules. 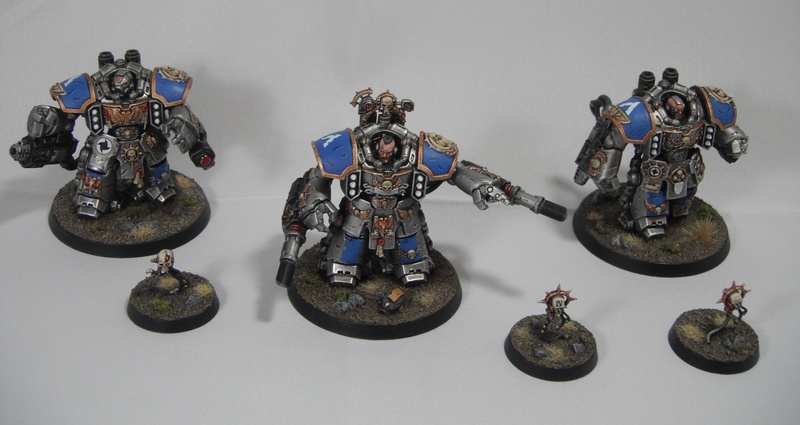 The site features some excellent conversions and paint jobs. Check out his Guardians-of-the-Galaxy-inspired ‘Space Tree People’, a truly creative combination of Dryad and Tyranid parts. Oldhammer and Rogue Trader by Quindia Studios. 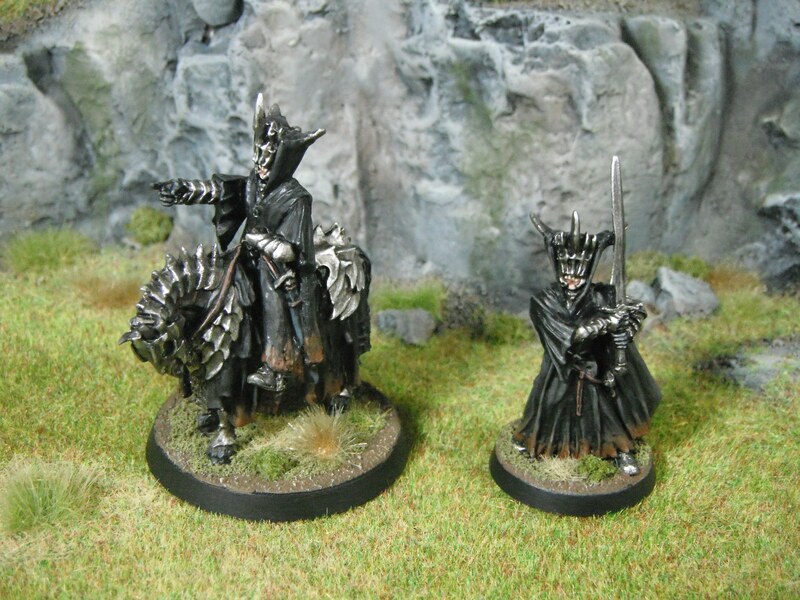 Another fantastic blog which combines old Citadel miniatures with those from other manufacturers. 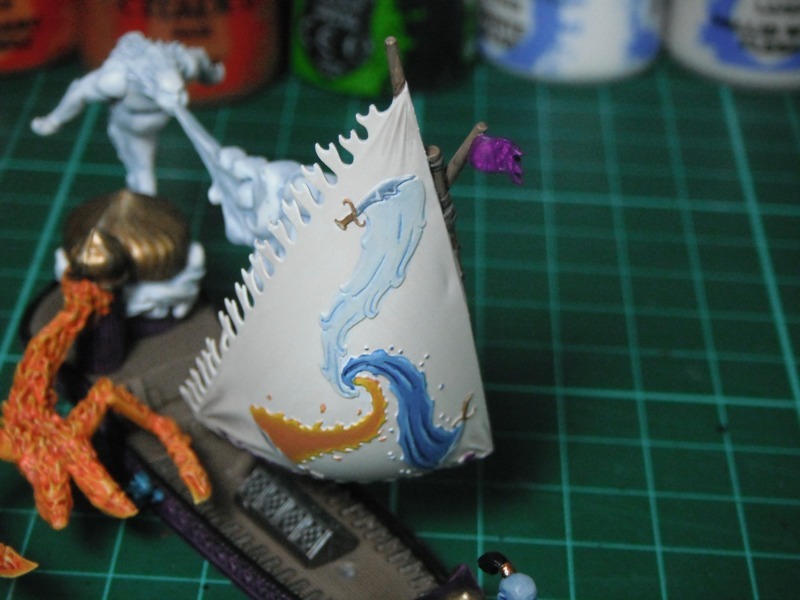 The blog is full of well-painted, colourful miniatures for both Warhammer and Rogue Trader. As well as focusing on the miniatures, the blog is currently in the process of publishing a chapter-by-chapter review of the original Rogue Trader rulebook which is very entertaining and informative. If you’ve never read this venerable tome or are new to 40k check it out, the author really captures the quirky and eccentric spirit of those early days of the hobby. Realms of Chaos is the blog of old-school gamer, Nico. 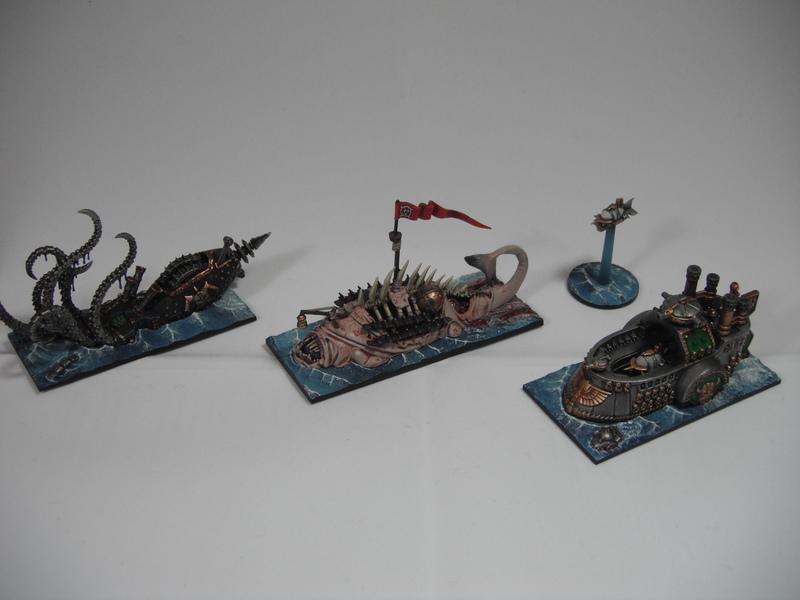 This was the first real Oldhammer blog I encountered and I was simply stunned by his fantastic Skaven army which really illustrates how well those old ’80s and early ’90s models stand up today with a decent paint job. His Epic models were also a real inspiration while I was working on my own Epic orks. The blog really captures the intense creativity of those early issues of White Dwarf and is a real feast for the eyes. This blog by Peter seems to have only recently started up again and has only a small amount of content at present. However, it is worthy of a mention for Peter’s amazing Undead army. These skeleton warriors were the first Citadel miniatures I ever owned and I wish mine had looked as good as these. This morning the above image appeared on Tale of Painters. 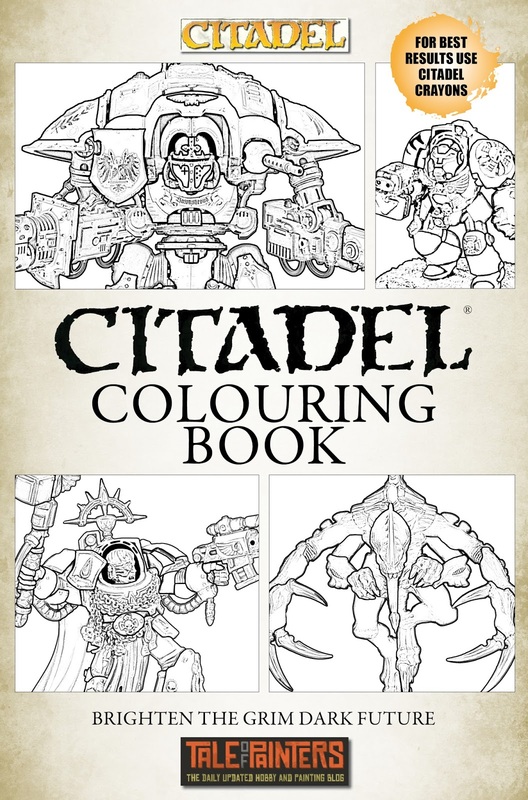 It purports to be a leaked image of the new Citadel Colouring Book and is clearly a light-hearted April Fools joke (you can read the full story here). I particularly liked one comment which read: “GW are also coming out with a giant box of Crayons to go with the coloring book. Every Crayon is an exact color match with GW’s paint line! I can’t wait! !” Obviously written by someone familiar with GW’s advertising rhetoric. This got me thinking about previous hobby-related April Fools jokes, including a couple from Games Workshop themselves (although sadly there is nothing from them this year). 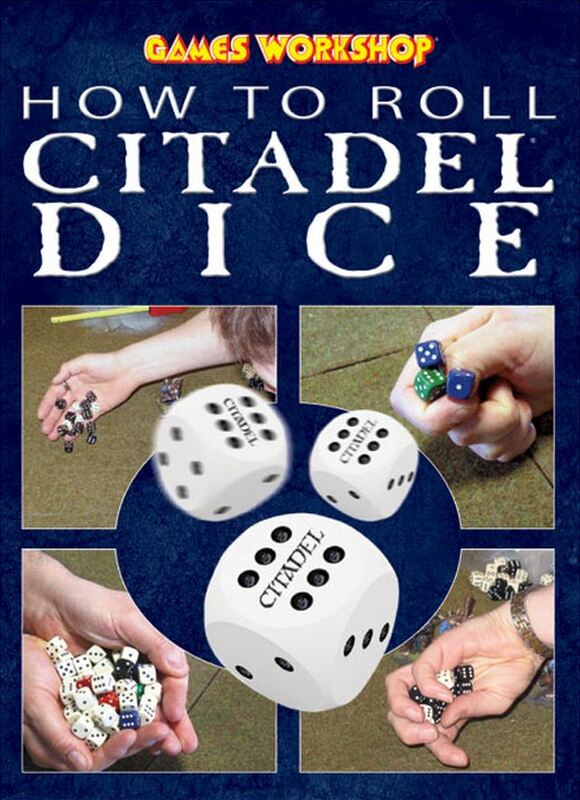 Yes, hot on the heels of publications such as How to Paint Citadel Miniatures and How to Build Wargames Terrain it’s How to Roll Citadel Dice, your indispensable guide to the world of random-number-generating cubes! 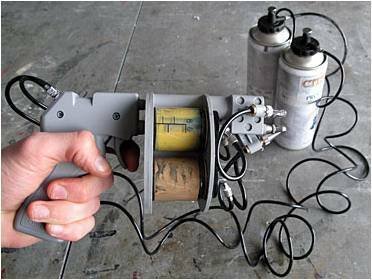 Another one from GW, this time a multi-barrelled version of the citadel spray gun which can basecoat, highlight and shade your miniature all in one go. The Citadel Colouring Book isn’t the first April Fools from the guys over at Tale of Painters, last year Garfy put together this tutorial on painting Bilbo wearing the One Ring. Possibly my favourite hobby April Fool. Since penning this article this morning I came across this great April fool by GW’s publishing wing, the Black Library. To celebrate the release of the Skitarii they claim to be releasing their first binary novel. You can even read an extract in binary here. Are there any others I’ve missed? Let me know in the comments below. 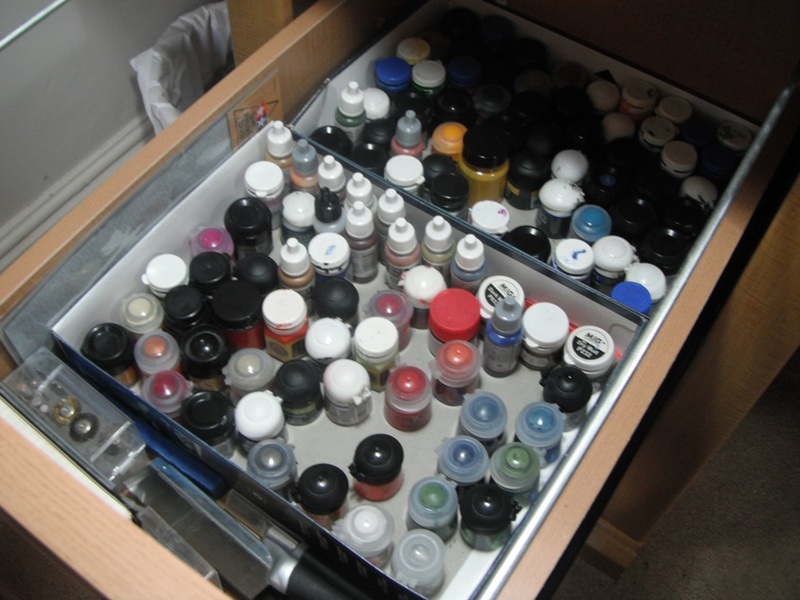 I think at some time or other we all let our hobby spaces get a bit disorganised, particularly if, like me, you don’t have a dedicated hobby area but have one that doubles up for other uses. Over the weekend I managed to build up the motivation to do a bit of tidying and get my hobby materials organised. 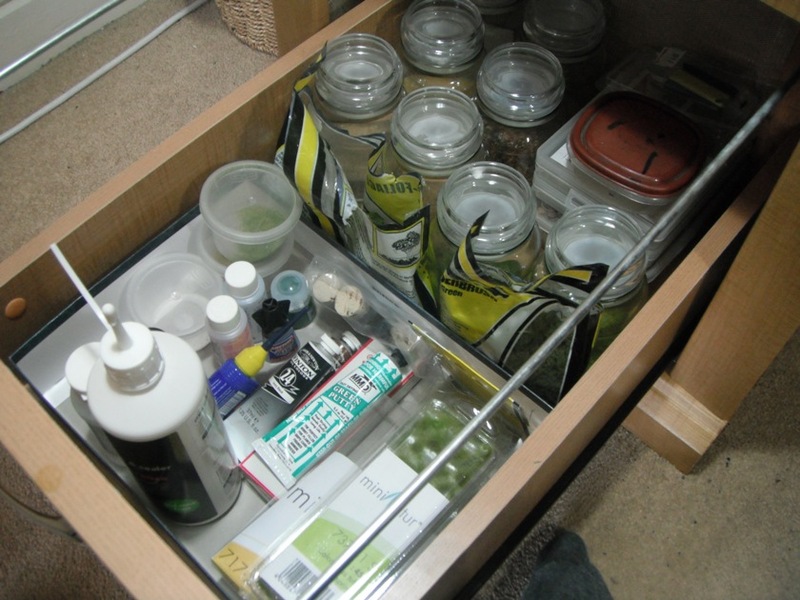 This should make finding what I need a lot easier and avoid unnecessary rummaging through boxes. Like many hobbyists, I loathe throwing anything away. I once had a purge of old models and unused components and still regret the loss of certain now hard-to-find components. However, keeping all of those spare sprues certainly takes up a lot of room and so I finally decided to bit the bullet and clip all of my unused components from their frames and store them in ziplock bags. 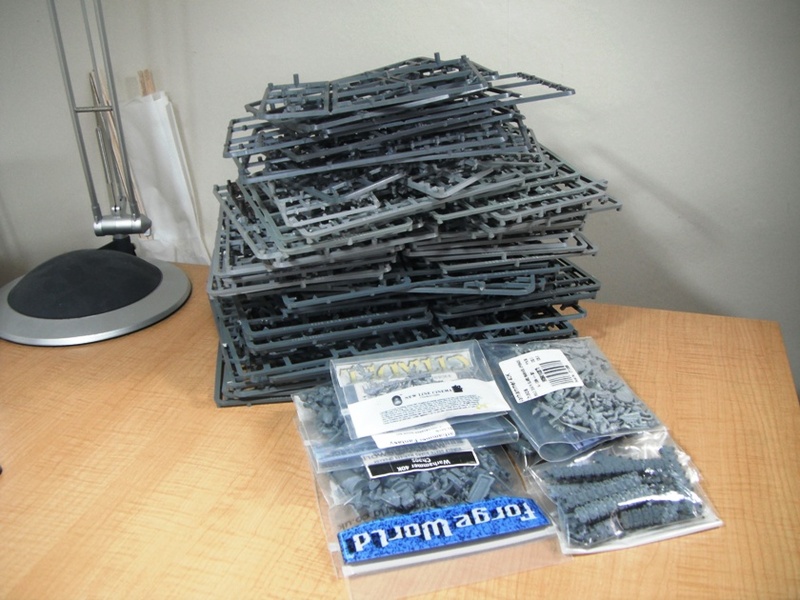 After a while snipping components off frames becomes oddly satisfying and I did manage to reduce the big pile of sprues you see here to the components in the bags. Unfortunately I have only just scratched the surface of this monumental task and I still have two drawers full of frames that need organising.